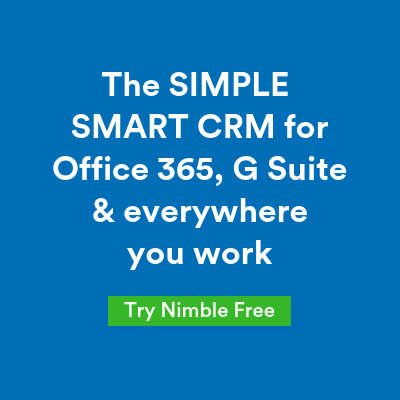 Previously, we introduced you to Nimble as “The Simple CRM for Office 365” to help unify your disparate contacts, emails, and calendar activities into a team relationship manager with simple sales and marketing. For individuals and teams of 2 to 25, Nimble is a perfect way to get started with contact management and social sales and marketing with Office 365. For larger teams, Microsoft Dynamics is an excellent solution that addresses more complex needs. As your company grows, Nimble can grow with you by adding value to Dynamics contacts. 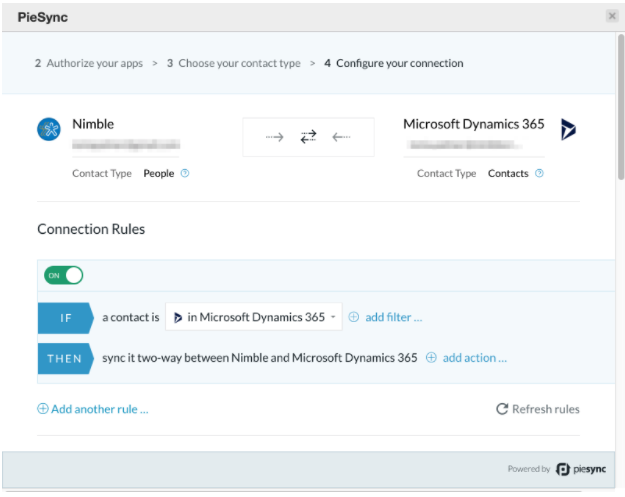 In this post, we’ll show you the benefits of using Nimble with Microsoft Dynamics to enrich your contact records automatically with social business insights; combine Dynamics contacts into a single system of record you can access anywhere, and to also bring your team’s Office 365 contacts into Dynamics. Once you bring your team contacts into Dynamics, you can continue building relationships within your MS Dynamics workflow. Dynamics is a comprehensive and intuitive customer relationship management application; paired with Nimble, MS Dynamics contacts are enriched automatically and become easily accessible wherever you work. Nimble is the simple, smart CRM built for Office 365 that works for you everywhere you engage: inside Office 365, Outlook inbox, on social media channels, in your web browser, in 140+ SaaS business applications (including Skype and Teams), and on your mobile device. It also works back inside all of the team’s separate apps, bringing Office 365 contacts into Dynamics and everywhere else your team works. Nimble combines your team’s contacts, communication history, sales opportunities, activities, and events into one unified relationship manager. It enriches records automatically with the social and business insights you need to take action and keeps itself up-to-date so you can focus on building better relationships. With the Nimble Smart Contacts App (available for Chrome, Safari, Firefox, and Edge), you can learn more about your contact’s work history, interest, influential topics, recent social interactions, and much more. By integrating Nimble and Office 365 through PieSync, Nimble can either be your simple CRM on top of your existing Office 365 workflows, or work in conjunction with Dynamics to give your team the intelligence and tools they need to ensure every person engaging customers and prospects has access to the same relationship intelligence. 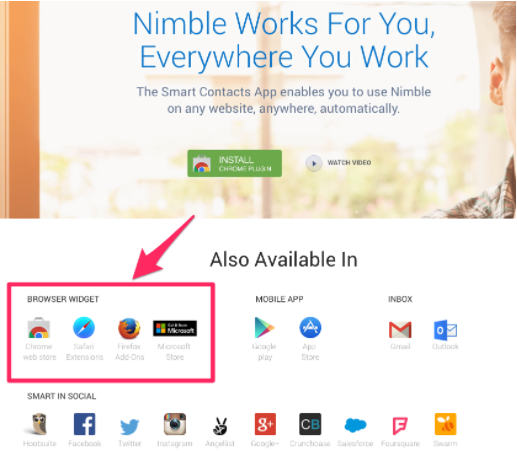 To install the Nimble Smart Contacts app, click here. You can also visit our FAQ page for a deep dive on how this feature works. You can then hover over or highlight a contact’s name within Dynamics and Nimble will deliver instant insights on your contacts; you and your team will be equipped with everything you need to know to connect with your prospects and customers on a genuine level to build better relationships. Click to discover what your contact is all about; where they work, where they’re from, their interests, and their complete social profiles — all in real-time, without having to leave Dynamics. The Nimble Smart Contacts App also provides you with full company details such as industry, employee count, the year they were founded, matching keywords, CEO, company type, revenue, location, phone numbers and much more. Social profiles of companies are also provided to give you a better idea of their social presence, who they follow, and who’s following them. By utilizing the Nimble Smart Contacts app, you can combine your Dynamics contacts into a single system of records which can be accessible everywhere you work — in Dynamics, your Outlook inbox, address book, calendar, or anywhere on the web. In addition to all of the enriched social data that Nimble delivers, the Prospector feature helps customers prospect smarter with complete contact information. Sales, marketing, and business development professionals now have an easier way to discover contact information for qualified prospects in seconds. With that said, the basic workflow for using the Prospector feature is to find the email address for a contact, send a message to them in Nimble via Group Messages, measure the effectiveness of that message with analytics and reporting, use Nimble to schedule follow-ups, and then turn that connection into a sales opportunity managed via Deals. Not only does Nimble enable you to gather insights on your Dynamics contacts from your Microsoft environment and continue working with them from within the app, it also enables you to update your contacts with the information Nimble has gathered for you. Nimble also enables you to gather insights on your Dynamics contacts from your Microsoft environment and continue working with them from within the app, it also enables you to update your contacts with the information Nimble has gathered for you using our PieSync integration. Combining Dynamics with Nimble allows your team to manage company contacts in a shared Nimble database; in addition to tracking email communication, sales, and activity with your most important contacts and leads. 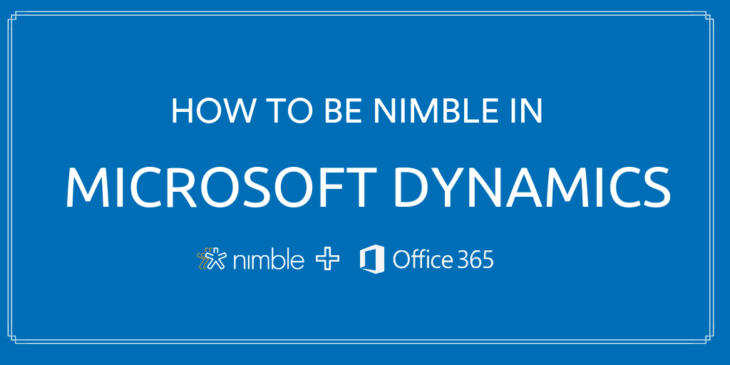 Look for future enhancements as Nimble continues to enrich our integration with MS Dynamics. Use Nimble on top of your MS Dynamics CRM, and you’ll be heads and shoulders above the competition. Learn how to get started on our FAQ page. Our Smart Contacts Apps for Microsoft Dynamics is one of many features available for all Nimble plans! If you do not have a Nimble account yet, we invite you to try it for free for 14 days.